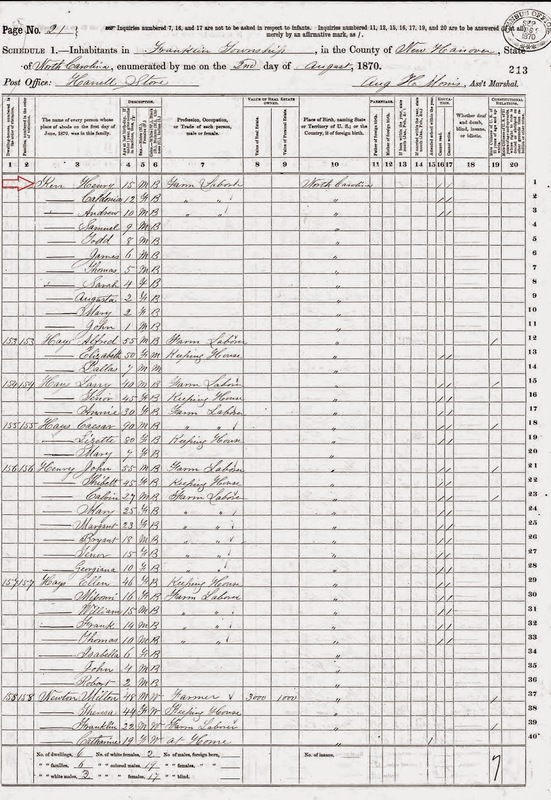 I've been looking at Federal Census pages from Franklin Township, Sampson County, NC for clues to help me with my research on my Kerr and Murphy ancestors. These two family lines are part of my paternal lineage. 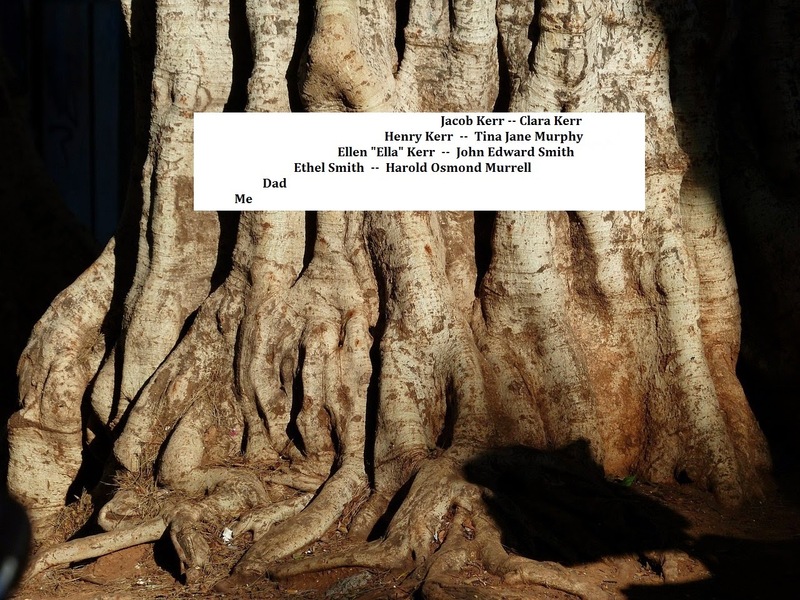 Here's how the names fit in my family tree. It's important to look at the folks who lived near your people. These were often friends, coworkers, fellow family members, or if you are African American you may find the folks who previously enslaved your ancestors. Jacob Kerr was my 3rd great grandfather, father to my 2nd great grandfather Henry Kerr. I wrote about Henry Kerr and his wife Tina Jane Murphy Kerr recently on this blog. It seemed like a natural progression to now take a look at Jacob Kerr and his neighbors in Franklin Township, NC. 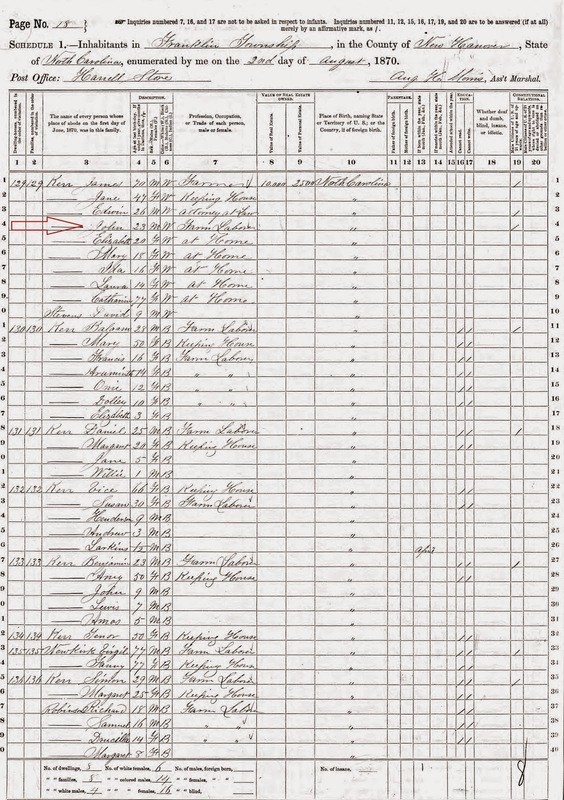 Franklin township was counted as part of New Hanover County, NC in 1870 for the census. Here's Jacob Kerr and his family. You'll see his son Henry Kerr was residing nearby. I have Jacob's household marked here with arrows. It's interesting to note that going back to 1870 Murphys and Kerrs have resided near each other. This particular Murphy family happened to be white. Could they have a connection to my 2nd great grandmother Tina Jane Murphy Kerr? I will be looking into this so if I come across something I will feature it in a future blog post. Jacob Kerr's household continued on to the top of the next page. I like to jot down on a piece of paper the surnames that I come across when I am look at a census page. If the ancestor you are researching stayed within the same community, the same surnames often come up again and again when looking for your ancestor or his/her descendants. I've been researching Jacob Kerr for a bit of time now, so I can verify that in the records I've looked at thus far these surnames continued to pop up around the Kerr family and their descendants: Hayes/Hays, Cromeday/Cromartie, Smith, Mckoy/Mckay, Bannerman, and Newton. I looked at several pages before and after the Jacob Kerr household and found a connection that allowed me to figure out how the Kerrs came about their land. On my post about Jacob's son, Henry Kerr, I featured the deed to land Henry purchased in 1879. I thought if Henry was able to purchase land then, it's quite possible that Jacob Kerr was able to purchase land as well. A white man by the name of John D. Kerr was the person who sold the land to Henry. 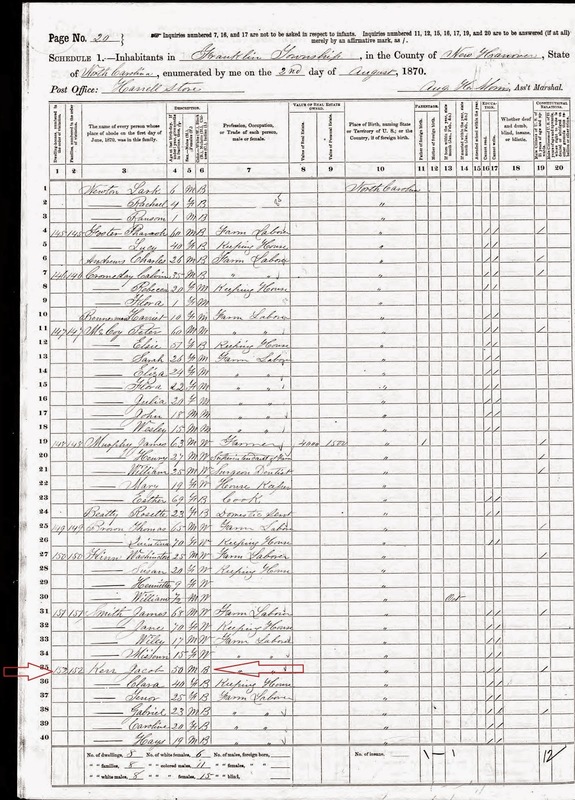 Would I find John D. Kerr's family near Jacob's family? You betcha. John D. Kerr I found two pages before Jacob's family. Here he is listed living with his parents and siblings. There's also several African American Kerr households listed here as well. These folks are probably kin and/or other people who were previously enslaved alongside Jacob Kerr's family. I have a lot of work ahead of me on figuring out who and how all these folks are possibly connected. Back to Jacob Kerr now. Was he able to purchase land like his son? The answer will be in my next post. I love the side research! Looking forward to more of this story. Thanks Kristin! I am getting a kick out of figuring out the community picture. That's great Andrea you've made so much progress! Thanks Victori! I still have so much more to do, but I keep plugging away at it. Andrea . I am so enjoying hearing about your research. I am looking forward to your next post. I can't wait to read the answer and if Tina Jane is related? Her name is lovely to me! You are gonna be quite busy! With those Sampson NC folks. Glad you got that Deed! True, these folks are making me work, but I am having fun doing it :) There doesn't seem to be enough time in the day to get everything done. Good advice! I always look at neighbors too, usually looking for that missing daughter hoping she's married to the boy next door. Often that is what happened.